Heroin was first synthesized in 1874 and it was thought to be not only non-addictive but useful as a cure for respiratory illness and morphine addiction, and capable of relieving morphine withdrawal symptoms. Later it was discovered to have the same pharmacologic effects as morphine and to be just as addictive. In the United States, heroin is a Schedule I drug and is illegal for any purpose. In the United Kingdom heroin is available on prescription, though it is a restricted Class A drug. According to the British National Formulary edition 50, diamorphine hydrochloride may be used in the treatment of acute pain, myocardial infarction, acute pulmonary oedema, and chronic pain. The treatment of chronic non-malignant pain must be supervised by a specialist. The BNF notes that all opioid analgesics cause dependence and tolerance but that this is "no deterrent in the control of pain in terminal illness". When used in the palliative care of cancer patients, heroin is often injected using a syringe driver. In comparison to morphine, it may cause less nausea and hypotension and can be dissolved in a smaller quantity of liquid. Heroin is also widely and illegally used as a powerful and addictive drug producing intense euphoria, which often disappears with increasing tolerance. Although many other ?-opioid agonists (e.g., morphine) can produce essentially the same effects, it is thought that heroin's popularity with recreational users comes from its especially rapid onset. This in turn comes from its high lipid solubility provided by the two acetyl groups, resulting in a very rapid penetration of the blood-brain barrier after use. Heroin can be taken or administered in a number of ways, including snorting it, and injecting it. It may also be smoked by inhaling the vapors produced when heated from below (known as "chasing the dragon"). 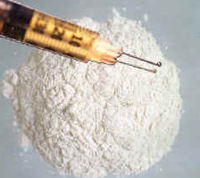 Once in the brain, heroin is rapidly metabolized into morphine by removal of the acetyl groups. It is the morphine molecule which then binds with opioid receptors and produces the subjective effects of the heroin high. Heroin is therefore a prodrug. The onset of effects from heroin is dependent on the method of administration. Orally the heroin is totally metabolized in vivo into morphine before crossing the blood-brain barrier, so the effects are the same as morphine when taken by mouth. Snorting heroin results in onset within 10 to 15 minutes. Smoking heroin results in a rush within 2-5 minutes. Injecting heroin intravenously results in rush and euphoria within 7 to 8 seconds, while injecting heroin intramuscularly takes longer, having an effect within 5 to 8 minutes. Heroin is also widely and illicitly used as a powerful and addictive drug producing intense euphoria, which often disappears with increasing tolerance. Although many other opioid agonists (e.g., morphine) can produce essentially the same effects, it is thought that heroin's popularity with recreational users comes from its especially rapid onset. This in turn comes from its high lipid solubility provided by the two acetyl groups, resulting in a very rapid penetration of the blood-brain barrier after nasal inhalation or intravenous injection. Once in the brain, heroin is rapidly metabolized into morphine by removal of the acetyl groups. The withdrawal syndrome from heroin (or any other short-acting opioid) can begin within 12 hours of discontinuation of the sustained use of the drug: sweating, malaise, anxiety, depression, persistent and intense penile erection in males (priapism), general feeling of heaviness, cramp-like pains in the limbs, yawning and lachrymation, sleep difficulties, nausea and vomiting, diarrhoea, cramps and fever occur. Many addicts also complain of a painful condition, the so-called "itchy blood". Abrupt termination of heroin use causes muscle spasms in the legs of the user, hence the term "kicking the habit." However, it must be noted that each person's symptoms can be unique. There is also a significant risk of tonic-clonic or grand mal seizures (although less so than during withdrawal from sedatives such as barbiturates), which can lead to stroke possibly resulting in permanent disability including blindness or paralysis, or heart attacks, which can potentially be fatal. Users seeking to take the "cold-turkey" (without any preparation or accompaniments) approach are generally more likely to experience the negative effects of withdrawals. Two general approaches are available to ease opioid withdrawal. The first is to substitute a longer-acting opioid such as methadone for heroin or another short-acting opioid and then slowly taper the dose. The other approach, which can be used alone or in combination, is to relieve withdrawal symptoms with non-opioid medications. In the second approach, benzodiazepines such as diazepam (Valium) ease the often extreme anxiety of opioid withdrawal. Many symptoms of opioid withdrawal are due to rebound hyperactivity of the sympathetic nervous system, and this can be effectively suppressed with clonidine (Catapres), a centrally-acting alpha-2 agonist primarily used to treat hypertension. Many addicts who have been through these programs say that the agony of withdrawal is very much attenuated. For those who repeatedly fail attempts at complete detoxification and relapse to heroin use, maintenance with regular doses of methadone is recommended.